The 1979 Tumaco earthquake occurred at 02:59 local time on 12 December with a moment magnitude of 8.2 and a maximum Mercalli intensity of IX (Violent). 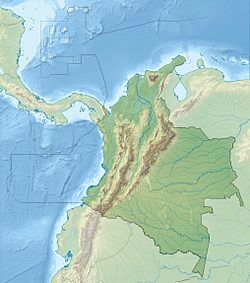 The epicenter was just offshore from the border between Ecuador and Colombia, near the port city of Tumaco. It triggered a major tsunami, which was responsible for most of the estimated 300–600 deaths. The hardest hit area was Colombia's Nariño Department. Coastal parts of Ecuador and southern Colombia lie above the convergent boundary where the Malpelo Plate subducts beneath the South American Plate along the Colombia–Ecuador Trench. At his location the Malpelo Plate, the microplate northeast of the Nazca Plate, is moving to the east relative to South America at a rate of 58 mm per year. North of the Carnegie Ridge, the subduction interface has four recognisable segments, from south to north, the Esmeraldas, Manglares, Tumaco and Patia segments. This plate boundary has been the location of several great historical earthquakes, most associated with damaging tsunamis. In 1906 a 5–600 km long segment of the plate interface ruptured, causing a M 8.8 earthquake (rupturing all four segments) and a trans-Pacific tsunami. This event was the last of three earthquakes that ruptured adjacent parts of the plate interface, forming a northeastward migrating sequence. The 1942 earthquake ruptured the Esmeraldas segment, the 1958 earthquake ruptured the Manglares segment and the 1979 event ruptured the Tumaco and Patia segments. Together they ruptured the same part of the megathrust as the 1906 earthquake. The rupture area of the 1979 earthquake measured 280 km long by 130 km wide. The earthquake was widely felt in both Ecuador (including Guayaquil, Esmeraldas and Quito) and Colombia (including Bogotá, Cali, Popayán and Buenaventura). The coast in the epicentral region subsided by up to 1.6 m during the earthquake and the land movement locally disrupted river drainage. The coast nearest the epicenter was hit by the first wave of the tsunami about three minutes after the earthquake. Three to four waves were observed, with the third being the highest. The third wave coincided with low tide, greatly reducing the extent of the inundation and the likely death toll. The maximum observed water height was 6.0 m at San Juan de la Costa, northeast of Tumaco. The tsunami was observed on the east coast of Japan, in Hawaii, Tahiti and Mexico. The earthquake caused widespread damage, particularly in Tumaco, where about a tenth of all buildings were destroyed, including 1,280 houses, and 25 people were reported either dead or missing. The fishing village of Charco was almost completely destroyed by the tsunami, the waves washing the houses inland into a nearby lake. 93 of the original population of 4,000 were reported either dead or missing. The tsunami also destroyed all the houses in San Juan de la Costa, with 199 reported either dead or missing. The total death toll was estimated to be 500–600 with another 4,000 injured. The damage caused by this earthquake and the 1983 Popayán earthquake, near central Colombia, led to the development of a national building code for earthquake-resistant structures for Colombia, which came into law in 1984. ^ a b Kanamori, H.; McNally, K.C. (1982). "Variable rupture model of the subduction zone along the Ecuador-Colombia coast" (PDF). Bulletin of the Seismological Society of America. 72 (4): 1241–1253. Retrieved 26 August 2012. ^ a b c d National Geophysical Data Center. "Comments for the Significant Earthquake". Retrieved 25 August 2012. ^ a b White, S.M.M. ; Trenkamp R. & Kellogg J.N. (2003). "Recent crustal deformation and the earthquake cycle along the Ecuador-Colombia subduction zone" (PDF). Earth and Planetary Science Letters. 216 (3): 231–242. Bibcode:2003E&PSL.216..231W. doi:10.1016/S0012-821X(03)00535-1. Archived from the original (PDF) on 2011-07-20. Retrieved 25 August 2012. ^ Herd, D.G. ; Youd, T.L. ; Meyer, H.; Arango, J.L. ; Oerson, W.J. ; Mendoza, C. (1981). "The Great Tumaco, Colombia Earthquake of 12 December 1979". Science. 211 (4481): 441–445. Bibcode:1981Sci...211..441H. doi:10.1126/science.211.4481.441. PMID 17816596. Retrieved 25 August 2012. ^ a b c Soloviev, S.L. ; Kim K. & CGO Staff (1997). Catalog of Tsunamis in the Pacific, 1969–1982. DIANE Publishing. pp. 131–132. ISBN 978-0-7881-3931-4. Retrieved 27 August 2012. ^ a b National Geophysical Data Center. "Comments for the Tsunami Event". Retrieved 25 August 2012. ^ García, L.E. (1984). "Development of the Colombian Seismic Code" (PDF). Proceedings of the Eighth World Conference on Earthquake Engineering. Earthquake Engineering Research Institute. pp. 747–754. Retrieved 25 August 2012. ^ Garcia, L.E. ; Perez A. & Bonacci J. (1996). "Cost implications of drift controlled design of reinforced concrete buildings" (PDF). Paper No. 548, Eleventh World Conference on Earthquake Engineering. Elsevier. Retrieved 25 August 2012. This page is based on the Wikipedia article 1979 Tumaco earthquake; it is used under the Creative Commons Attribution-ShareAlike 3.0 Unported License (CC-BY-SA). You may redistribute it, verbatim or modified, providing that you comply with the terms of the CC-BY-SA.